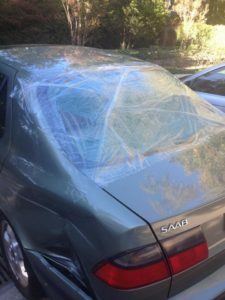 This is a quick “How-To” guide for Auto Glass Replacement After A Hail Storm in 2018. Severe hail storms can damage property at a devastating rate. In the auto glass world, enormous amounts of victims need their windshields & car windows fixed asap -AND THEY ALL CALL AT ONCE! In the 2016 San Antonio Hail Storm (arguably the worst Texas Hail Storm on record) we received over 900 phone calls before 7am and ~5600 calls in the first day. This is not an easy situation for anyone; customers, glass companies, or insurance companies. The affect is felt throughout country as a ripple of slowed or even halted productivity cripples industry. The question I want to answer for you is how do you pick the right professional auto glass company to fix your car window after a hail storm? This, of course, is only after you do what you can to keep your car windows safe during a hail storm. Fly by night/out of town scammers: The first obstacle you need to navigate is staying with a local provider. A local auto glass shop will be there for years to come. Look for a local address with a long history of online reviews. If all the reviews are in the last few months -stay away. If you see a pop-up tent in a parking lot -stay away. Months after a hail storm we are always inundated with “warranty” calls from customers that used a scammer. Part availability: Great you found a good, local company you can trust, but they can’t get the part. This is actually quite typical and the only way to try and avoid it is CALL NOW! Don’t wait a week, a day or even an hour or you could be waiting months. It’s a “first come, first served” world so be the early bird and get that glass! Pricing: Expect to pay more. At first glance it might seem like price gouging, right? Last month you called for a quote and it was $250 and after the hail storm they say it’s $400 -why? Well before the hail storm it takes 20 minutes to pick up parts from the warehouse, but after a major hail storm it can take up to 4 HOURS! Yes you heard that correct in 2016 we were going to get auto glass in Austin, Tx to avoid standard 3-4 hour wait times. Not to mention we had technicians staying in temporary housing from Austin, Dallas & Fort Worth. These additional costs are passed on to the customers, even if their car glass request isn’t related to hail damage. Why wait? : You may not have a choice. However, if you don’t absolutely need to get your car window replaced after a hail storm you’ll want to wait. There are several reasons to wait; pricing, hassle and quality of workmanship. The price will be lower once rush is over and things return to normal. The time it takes to make your order and ease of scheduling will be in your favor if you wait. A well rested, low stress auto glass technician is always a better choice. Emergency Car Window Replacement: If you can’t find a local provider, parts are unavailable, price is too high, and you can’t wait the last option you have is to drive to another city. If in Austin, Texas you may want to try an auto glass shop in San Antonio, Dallas or even Houston. If the vehicle isn’t able to be driven you might be in a situation with no good outcome.